Although Toomas Heikkinen wrapped up the 2013 Global RallyCross championship at the previous event, all of the drivers of the GRC headed into the final event of the season in Las Vegas with the hopes of ending 2013 with a win. As he has done so many other times this season, Gymkhana and rally racing legend Ken Block was one of the fastest men in the field but unlike the previous races this season (and last), Block managed to avoid incident as he delivered a dominating win in both his heat race and the event finale. 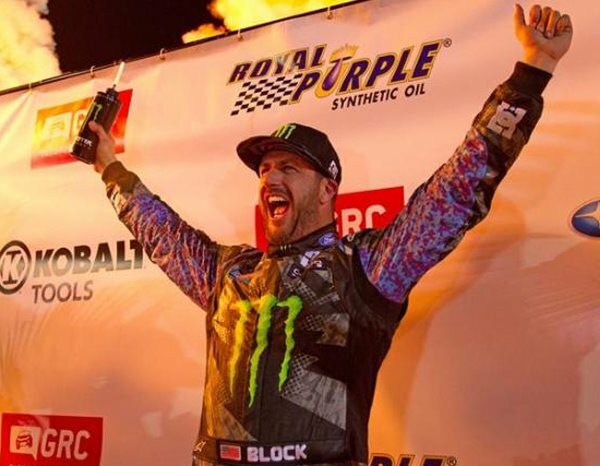 Block had won plenty of heat races before last night’s event but never before had Block been able to claim the top spot in the final race of the night. In the first heat race of the event, Tanner Foust, Sverre Isachsen and Steve Arpin squared off in what turned out to be a very uneventful race. Foust drove to an easy win and while Isachsen held the second spot for much of the race, Arpin used the shortcut “joker” turn on the 4th lap to grab the second and final transfer spot. Isachsen would be forced to go onto the last chance qualifier (LCQ). In heat race #2, Topi Heikkinen, Brian Deegan, Patrick Moro, and Patrik Sandell lined up to battle for the next two transfer spots to the final race. On the start, Heikkinen and Moro got appeared to leave on time but they both got a huge advantage over Deegan and Sandell. After the first lap, the four cars were lined back up for a second restart due to some confusion on the first start. On the restart, Topi got out to another big lead in a hurry while Deegan and Sandell battled through the first turn. Deegan leaned on Sandell as they came around second turn, forcing Sandell into the wall. When his Fiesta bounced off of the wall, he hit Deegan’s car and damaged the left rear wheel – ending Deegan’s heat. Moro would run into mechanical issues a lap later, allowing Topi to take the easy win while his teammate Patrik Sandell claimed second spot. In the third heat race of the night, Ken Block, Bucky Lasek, Stephan Verdier and Travis Pastrana squared off for the next to transfer spots. Pastrana took the early lead over Block and the two would battle hard with both cars frequently up on two wheels over the course of the first four laps. At the end of the fourth lap, Travis took his Dodge Dart a bit too wide and Block snuck under him for the lead. Block would never look back as he took the heat win while Pastrana held off Verdier for the second spot. In the fourth heat race of the day, fans saw Rhys Millen, Nelson Piquet, Bryce Menzies and Scott Speed go at it. The race was tight at first but when Rhys Millen hit the wall and Piquet dropped off of the lead pace, Scott Speed drove to an easy win while Bryce Menzies grabbed second – qualifying for the final race for the first time in his career. The Last Chance Qualifier saw Sverre Isachsen, Brian Deegan, Patrick Moro, Bucky Lasek, Stephan Verdier, Nelson Piquet and Rhys Millen fighting for the last two final spots of the event. Deegan got a great launch but when he got too aggressive going into turn one and clipped the front of Isachsen’s Subaru, he spun hard and hit the outside wall. Nelson Piquet and Rhys Millen battled early on for the lead but as Millen fell back, Piquet was left to race with Isachsen for the second spot. On the last lap, the racing between Sverre’s Subaru and Nelson’s Mitsubishi got hot and heavy and as Isachsen cut across the front of Piquet’s car, Nelson spun the Subaru hard into the outside wall. Piquet finished second in the LCQ but after an angry inquiry by Isachsen, the GRC officials ruled against Piquet so Sverre was handed the second spot into the finals. The Las Vegas GRC final race had ten drivers in the field with Foust, Speed and Block in row 1, Aprin, Sandell and Menzies in row 2 and Millen and Isachsen in row 3. On the start, Tanner Foust jumped out to a small lead while the other nine cars wrestled – and I mean wrestled – for position. When the smoke cleared towards the end of the first of 10 laps, Tanner was first, Block was second, Pastrana was third, Isachsen was fourth and Sandell was fifth. During the third lap GRC race control announces that Tanner Foust left too early and he was assessed a stop and go penalty. While in the penalty box, both Block and Pastrana passed Tanner so as Foust pulled his Rockstar Fiesta back onto the track, he was locked in a tight battle with Travis Pastrana for second place until Pastrana went too wide before the jump which allowed Tanner to grab the second spot. Pastrana then found himself battling with Topi Heikkinen when, during the 7th lap, Topi got into Travis in the same turn where Piquet spun Isachsen. Like Piquet, Topi was penalized with a stop and go penalty which allowed Pastrana’s #199 Dodge Dart to get back into the third position and the top three drivers never looked back. Block claimed his first ever GRC win with Tanner Foust in second and Travis Pastrana in third – marking the best finish of the season for Pastrana as well as Block. The full results are below. Block’s win not only gave him his first win in Global RallyCross ever but it also allowed him to jump into the 3rd spot in the championship standings. Topi Heikkinen claimed the 2013 GRC championship at the Charlotte event and Tanner Foust had all but sealed up second spot coming into Vegas. Brian Deegan had a chance to catch Foust in the final race but with Deegan’s wreck in the LCQ and Tanner’s second place finish, Foust grabbed the #2 spot in the championship while Block jumped over Deegan for third. In terms of manufacturer’s bragging rights, Ken Block’s win adds one more win for Ford Motor Company – with a Fiesta winning 8 of the 9 events this season. Ford comfortably won the manufacturer’s championship along with Ford drivers claiming each of the first five spots in the 2013 GRC championship. The only non-Ford to win a race this year was Liam Doran in his Mini racer. Congratulations to Ken Block on winning his first ever Global RallyCross race, to Topi Heikkinen for winning the 2013 GRC championship and to Ford Motor Company for the sheer and utter dominance that was displayed throughout the entire 2013 GRC season.